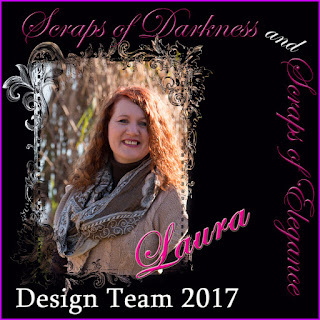 I recently received my 'Sparkle and Shine' Scraps Of Darkness kit and I couldn't wait to get creating. To Begin with I fussy cut one of the worlds out of the paper and layered it over the Grateful heart paper and the Rose Dreams paper. I added Papermania Wild Rose Jumbo Crochet Trim from the elements add on. Here is a close up of those really pretty flowers. I also added some Prima Rose Quartz Puffy Stickers from the main kit - they are really cute!